While you can have too many taxes, you can never have enough information, or ways to access it, about taxes. And so was born, on June 5, 2006, the Carnival of Taxes. And as you can see from our archives, we've been going strong ever since. C'mon. Admit it. A tax carnival is a natural. By the time you finish filing your forms, you feel kind of queasy, like you just got off a Tilt-A-Whirl. Sometimes it's a full-blown nausea, reminiscent of too many hot dogs or cotton candy consumed as you strolled the carnival grounds. And when it comes to taxes, we too often empty out our wallets, handing our money over to the IRS like the agency was one of the game operators lining the midway. 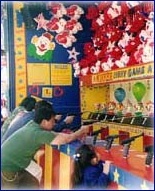 At a carnival, though, when you play one of the games, you at least have a chance to win a prize. The Carnival of Taxes aims to offer you the same opportunity. But instead of handing out stuffed animals, this carnival will be distributing tax saving tips, tax planning strategies, commentary and humor (hey, carnivals are supposed to be fun!) from throughout the blogosphere. Below you'll find some general information on and guidelines for the Tax Carnival. If you're a frequent participant in blog carnivals, most of this info probably will sound a bit familiar, but please give it a look before submitting an item. What is a blog carnival? It's a community of like-minded bloggers who share their insights on a particular topic. In the financial area alone, you'll find many valuable blogs (several of them listed in my left nav bar). I hope these folks will see fit to send their tax-relevant offerings this way. When is the Carnival of Taxes published? During tax season -- which I have deemed to begin in December when folks are making some frantic year-end tax moves and run through April -- we will post a Tax Carnival every other Monday. During the off season, May through November, we will go to once a month. This schedule, of course, is subject to change depending upon myriad variables, the most important being my workload! When an edition publication date is changed, I'll announce the change as a regular post in Don't Mess With Taxes. In addition, you can check upcoming Tax Carnival dates in the "future hosts" tab at our Blog Carnival page. More on this page in a minute. What will go in the Tax Carnival? Any and all items of tax interest. It will be a continuing compendium of tax-related postings, ranging from tax news updates to commentary on taxes (and the politics and politicos who create them) to tips to tax-filing and tax-saving strategies to paying, and paying less of, them. What won't go in the Tax Carnival? While I want to have a pretty big carnival tent, I do ask that submissions be primarily tax-focused. For example, a thorough look at an investment strategy that then throws in the sentence "Of course, you'll owe taxes on the earnings." at the end won't cut it. How much of a tax bill? Can you reduce or avoid them (preferably legally)? If you don't want to address that tax aspect, then you won't make it into the Carnival of Taxes. And while opinion pieces aren't expressly excluded, I do ask that you send reasoned ones and stick with facts that can be supported and rationally argued. We all have our personal and political perspectives on tax policy and those who create it, but this carnival isn't designed to be a rampant tax and/or politician slamfest. When someone or some tax deserves a tougher look, even castigation, we'll let you at them, as long as you show why such criticism is warranted. Other content not deemed appropriate, either because of its content and/or presentation, also won't make it into the Carnival. Carnies, cyber and terrestrial, have a tough enough rep without adding questionable content into the mix. I consider myself a pretty easygoing sort and liberal in most senses of the word, but sometimes holds need to be barred. You know the standard: I can't tell you what won't make the cut, but I'll know it when I see it. And in that case, Carnival readers won't see it. Who decides what goes in the Carnival? The host, who usually is moi. Some fellow tax bloggers have hosted past editions and I'm always open to guest hosts. So if you'd like to be Lord of the Tax Midway for one or several carnivals, just let me know. What's the deadline for submissions? To make it into a Carnival, please submit your blog item by 11 p.m. host time (that's Central for me) the Saturday before the scheduled posting date. That will give me all day Sunday to sort through the many submissions and pull them into the carnival they deserve. How many items may I submit? So that we get as much participation as possible but also keep the Carnival from getting out of control, please submit only one item per person and/or per carnival. When a blog has multiple members/contributors, exceptions can be made at the discretion of the carnival host (usually me). If I get more than one, I'll make the call as to which one gets in what particular carnival. If you submit an item, then find you have one later that is more timely, send the time-sensitive one and note that it needs to go sooner rather than later. I'll bump the evergreen item to a later carnival. Where do I send my submissions? You can e-mail me at taxcarnival@gmail.com or via the Carnival of Taxes page. Finally, there's one thing that can't be repeated enough: this is a Tax Carnival. Don't even think of trying to slip a nontax item past me. I will spot it and reject it and if you persist on such carnival spam, you will make my [fill in your expletive of choice] list. Once you get on that, I'll automatically delete your submission even if you finally get it through your head that I'm looking for tax posts only and send one my way. I think that's all you ever wanted to know about Tax Carnivals but were afraid to ask … for now! These guidelines, publication schedule, etc., may be revised as necessary, or at my whim; it is, after all, my Tax Carnival! For the complete and continuing list of Tax Carnivals, check out our Archives. To see the dates of upcoming Tax Carnivals check the "future hosts" tab at our Blog Carnival page. If you have any comments, suggestions or questions that I didn't address here, drop me a line at taxcarnival@gmail.com. The same goes if you just want to chat about taxes or are interested in hosting an edition. Thanks for your interest in the Tax Carnival. I'm looking forward to hearing from you and getting your contributions to festivities where, to paraphrase Prince (and 007), we party like its 1040, Form 1040!